The European Starling is six inches long, has a pointed bill that is yellow most of the year and dark during the fall. Covered in black feathers, it has white spots on its head and body in the fall and shimmering green and purple feathers in the spring. It also has dark pointed wings and a short tail. The juvenile starling has grey-brown feathers with faint streaking. Adults are similar to black birds, cowbirds, and grackles but have a short tail and a chunkier body. 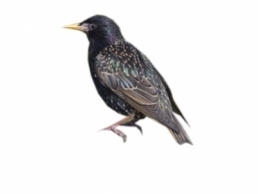 Starlings eat fruits, grains, seeds, insects, locusts, ground beetles, grasshoppers, crickets, moths and butterflies. They also eat invertebrates, berries and garbage. These small birds feed in large flocks often with blackbirds and return to the same area to eat each day. Starlings forge with other bird species including red-winged blackbirds, brown-headed cowbirds, robins, house sparrows, crows and rock doves. They walk along the ground probing the soil with their bills. CALL US TODAY AND REMOVE STARLING FAST.